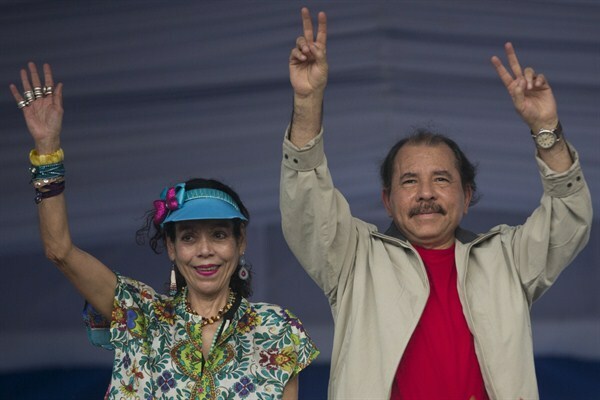 Nicaragua's President Daniel Ortega and first lady Rosario Murillo commemorate the 36th anniversary of the Sandinista National Liberation Front withdrawal to Masaya, Managua, Nicaragua, July 3, 2015 (AP photo by Esteban Felix). Thirty-six years after the 1979 revolution that overthrew the entrenched Somoza dynasty, Nicaraguans still fill Plaza La Fe in Managua to celebrate Liberation Day festivities every July 19. While to some it may look like an exercise in grand nostalgia, supporters of the Sandinista National Liberation Front (FSLN) and President Daniel Ortega view the revolution as an ongoing process. Yet some question how far the current administration has drifted from the guiding principles of the revolution and claim he is building a dynasty of his own.